A dividend of N4.8bn has been approved by shareholders of Guinness Nigeria Plc, a subsidiary of Diageo Plc, for the period ended June 30, 2015 with a pledge by the board and management to maintain sustainable growth for the business through good business strategies and quality products. The Chairman of the company, Babatunde Savage, speaking at the 65th Annual General Meeting in Abuja on 26 November 2015, said although the operating environment remained daunting during the period under review, the company recorded a credible performance in its full year results and is now poised for better performance in the 2016 financial year and beyond. “Going into the 2016 financial year, the board and management are resolute in their commitment to improve the performance of the company and deliver greater value and return on investments to shareholders,” he stated. Guinness Nigeria and its parent company, Diageo, Savage said, remain strongly committed to supporting Nigeria’s developmental aspirations through strengthening the country’s manufacturing base, employment creation, manpower development and fueling overall economic growth. In the area of corporate social responsibility, the Chairman stated that the company has continued to maintain a strong focus on impactful projects across its host communities, be it in the area of health, water provision, environmental protection and road safety. He reiterated Guinness’ commitment to continuously entrench the highest standards of good manufacturing practices and to ensure its products are top quality, noting that many of the company’s brands have been in existence for very many years, which is made possible by its focus on quality and customer satisfaction. Besides approving the 2015 financial result, shareholders also endorsed other resolutions tabled before them at the event, including the re-election of directors, approval of a dividend and election of members of the Audit Committee, the appointment of PricewaterhouseCoopers as the new auditors of the Company and the remuneration of the Directors. A general mandate resolution on related party transactions, which is a requirement of the Nigerian Stock Exchange, was also passed. Each shareholder earned a dividend of 320 kobo per 50 kobo ordinary share from the approximately N4.82 billion declared for the financial year, payable from 27th November 2015. The event also provided an opportunity for the shareholders to formally welcome the new Chief Executive Officer, Mr. Peter Ndegwa, who assumed office a few months ago. Sir Sunny Nwosu, the National Coordinator of the Independent Shareholders Association of Nigeria, congratulated Ndegwa on behalf of other shareholders, and commended the board and management of the company for declaring a dividend. Similar commendations came from Mr. Patrick Ajudua, National Chairman, New Dimension Shareholders Association; Chief Timothy Adesina, President, Nigerian Shareholders Solidarity Association and Princess Sopeju Efunremi Adetutu. 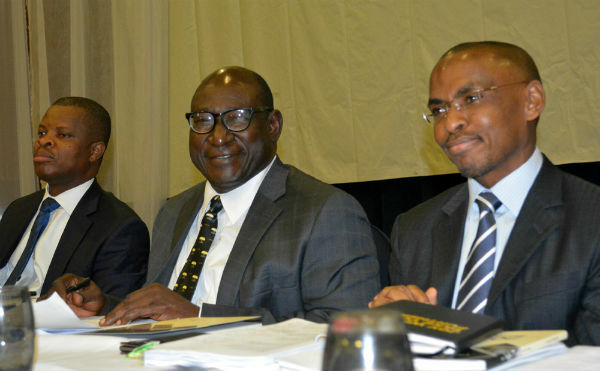 Ndegwa assured that Guinness will continue to strengthen its business through significant investments in manufacturing processes, local content development, product innovation, cutting-edge technology and capacity building; the aim being to ensure continuous enhancement of the quality of products from its stable.“Our strategy of maintaining a franchise that continues to generate sustainable returns to our stakeholders remains unshaken. Our continued investment in staff training, technology, innovation and system upgrades is to accelerate sustainable value creation for our customers and shareholders, as well as ensure that products rolling out of our plants are comparable to the best in quality in any part of the world,” he stated.